John Buzhardt (#403) was signed by the Cubs in 1954, and played in their minor-league system from 1954 to 1958. His major-league debut came on September 10th, his first of 6 appearances that year. In 1959, John played for the Cubs the entire season. Before the 1960 season, Buzhardt was traded (along with third basemen Alvin Dark and Jim Woods) to the Phillies for outfielder Richie Ashburn. John's two seasons in Philadelphia seem less than impressive. He compiled records of 5-16 and 6-18. 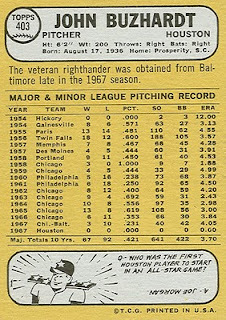 Two of his 6 wins in 1961 were the games just before and just after the Phillies' infamous 23-game losing streak. After the 1961 season, Buzhardt and third baseman Charlie Smith were sent to the White Sox for first baseman Roy Sievers. John fared better in his 5-plus seasons with the Sox than with the Phillies. (It was probably the team!) Twice he got double-figures in wins. Twice his ERA was under 3.00. For awhile, he was actually on par with Gary Peters, Joe Horlen, and Tommy John! 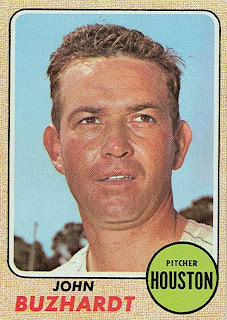 1968 was John's final season. He appeared in 39 games for the Astros - his most since 1961.